I love these because they prevent tangling , & falling off hooks. The superist hanger for plants ever. Can turn so easily. This has saved several of my plants. Great!!! Safety is a Spin Away! I used to stand on a stepladder and try to "lift" my heavy hanging planters to rotate them under the garage eave. Now, with the spinners, I can just turn them as often as needed without danger of falling or straining myself and yet they are tight enough to not just arbitrarily spin in the wind. They make watering all sides easier too. These spinners do exactly what they're intended to do. They are heavy-duty, very well made, and should last a long time. They easily enable turning the hanging baskets so they can be watered, trimmed or otherwise tended to. This hanging plant accessory is great for outdoor and indoor hanging plants. You'll find this is useful also when hanging home decor items (e.g. balloon lamps, holiday decorations). I've been looking for something like this for a long time - glad to finally find it. Good quality, too. It's easy to turn baskets to keep blooming evenly. 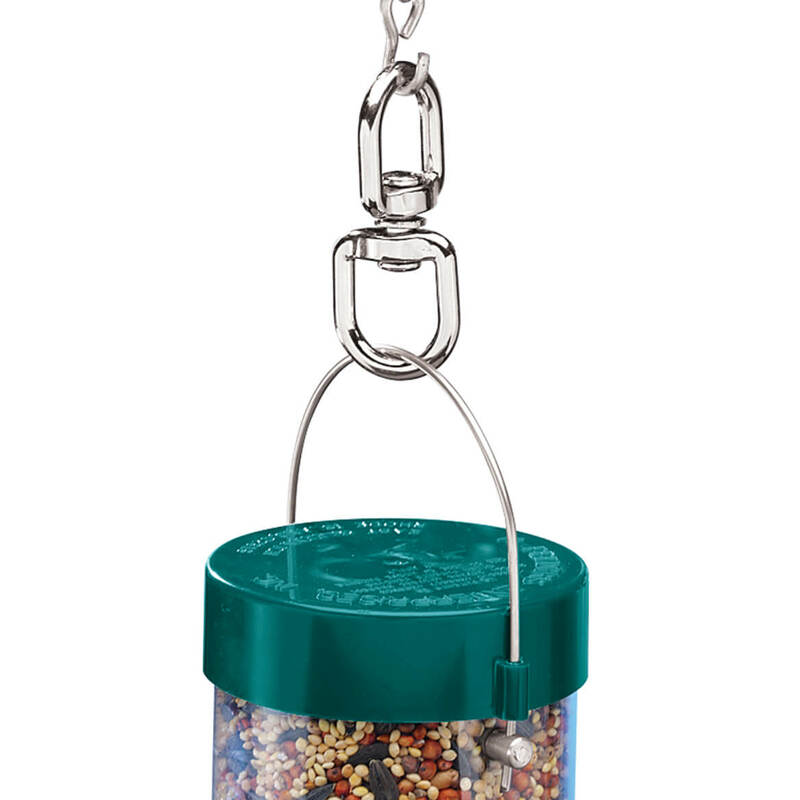 Great for hanging baskets,bird feeders,etc. 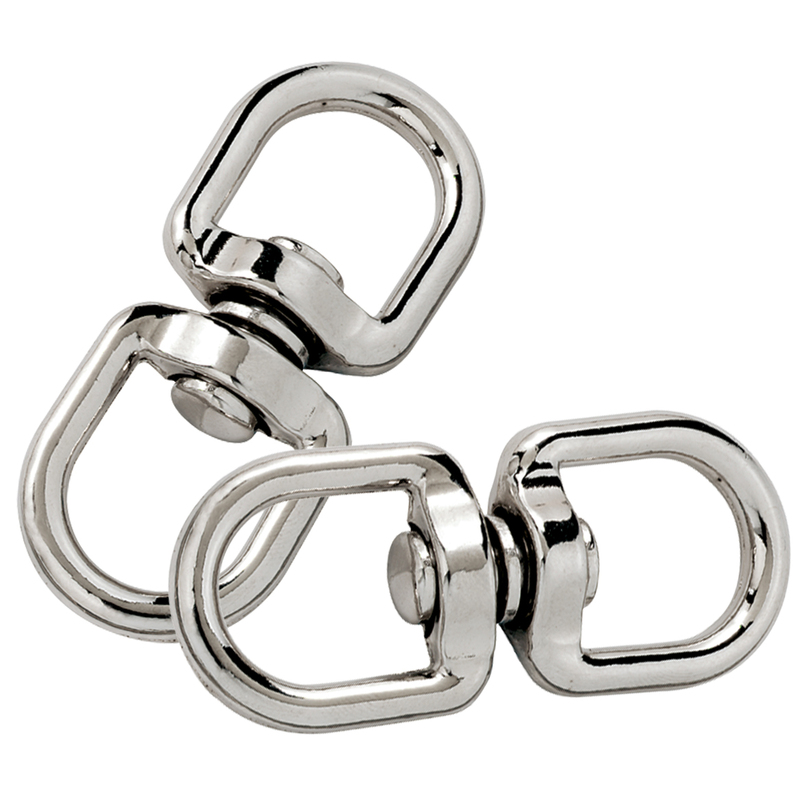 These swivels were just what I was looking for. They hold a good bit of weight and useful for hanging baskets on the back porch. I am ordering more of these. These are great for turning plants to evenly get sunlight. Easily helps plant hangers spin with the wind, instead of breaking or falling. Helps keep wind chimes from tangling. Very sturdy and well-made, should hold up well...and the price is right. I highly recommend these! Unable to find basket spinners locally; knew I'd find them again at Miles Kimball. Every year I buy more as I add to my garden with hanging plants. You should always turn your plants for equal sun exposure. With heavy plants it's hard to turn when you have to lift and move it around. With these - just 'spin' it!! I am pleased with the product. It does exactly what I wanted it to do. I use these on my hanging baskets. Easy to turn to water. The basket spinners make watering and turning my hanging flower baskets for equal amounts of sun & shade very easy. Love them! Saves money! The plants do not fall in high winds. Holds planters indoors and outdoors, and my prime use is for my humming bird feeders. Perfect! Love this product. The continuous spin prevents plant hanging basket hooks from breaking etc. Also great for all other hanging devices wind chimes, wind socks etc. Thanks again for selling this product. I turn my plants on a weekly basis so they get an even amount of sunlight. This, no longer, requires difficult lifting. I have purchased these for friends also. While I love to garden, I'd rather buy the full flowered baskets ready to hang; however, the hooks are rigid causing the basket to not swing free. 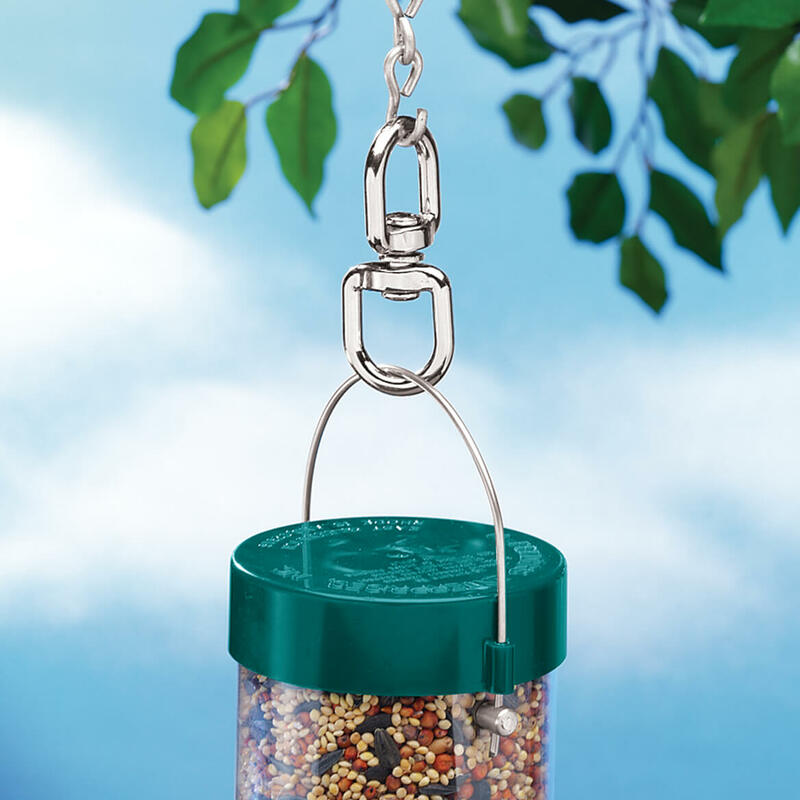 These strong and durable spinners allow the basket or a bird feeder to move freely. Access to plant is easy for watering, etc. I use mine in the house. My house plants always grew to one side because I was to lasy to get up on a step stool and take them down and turn them. With this product you don't have to do that, just give a twist and it's done. I use these for my hanging plants and also for several spinners. We have wind much of the time and the spinners would wear through and pull out. Since I hung one on this basket spinner, it has lasted for three years because it also spins and takes pressure off of the small pin on the spinner. I used the spinner for a decorative lightweight metal hummingbird spinner. This allows it to spin freely with the wind and you can see the beautiful 3-D effect in the spinner. Just what I needed for my planters as now the chains won't break in the wind as now they can spin and not get twisted and break. This was just what I was looking for to hang my windsocks from the porch eave. I used the Basket Spinners on hanging plants that were hung on a Shepherd's Hook attached to the back porch banister. As the spinner added length to the basket hanger it put more stress on the shepherd's hook. So far it is holding, however I will watch it carefully. Found that these are not recommended unless you have hangers with hook ends, I had to adapt with zip ties. Would be great idea if you could fix 1 end so could attach hanger that is nopn hook. Keeps hanging plants evenly exposed. When hanging baskets are stationary thet do not bloom evenly. Even slight breezes keep them beautiful. These are a great idea -I had used them indoors, so this year am using them on my porch plants as well. The construction is sturdy and withstands any weather. Can be used year after year. It's so easy to spin the plants- indoors or out -so they can catch the sun - just a turn of the wrist. MY PLANTS LOOK FULLER AND HEALTHIER - BECAUSE THEY ARE!! Easier to handle hanging baskets! must be free.. I did not choose. For wind chimes and spinners. I purchased these before and they work well for my hanging houseplants. I can rotate my plants easily,so they get sun evenly on all sides. Works great! Will help turn our hanging baskets toward the sun at all times. Have lots of wind and this will serve my plant from not tangling. Have bought these before and they work well and last a long time. I love feeding the birds, but the hooks bind up when it is windy, these should keep everything moving smoothly. Need to be able to turn plants so all sides get enough sunlight. Needed something that will withstand wind. Works well with hanging baskets. I can use this for more then just my bird feeders. Plants, wind chimes, decorative items, etc. Have hummingbird feeders and thought it would work well on the shepherd hooks. Very useful item for garden décor I purchased recently. I found things in this catalog that I haven't seen other places--outstanding selection and quality. These allow my hanging baskets to spin if it gets breezy and also allows for movement while watering and removing dead blooms. I have purchased these before and they work great! I already have a number of these spinners, and they work quite well to turn hanging plants without having to lift them off their hooks each time. To make it easier to turn plants so they grow more evenly. I need spinners that work. To make it easier to water hanging plants on deck. Needed for my wind chimes. 2. Needed for wind spinners & plants & could not find locally. My hanging baskets don't tangle their chains, and the plants turn themselves to present different sides to the sun. We live in a very windy rural area. We use these hooks to keep my Boston Ferns from getting wind burn. They work GREAT. I needed these for my plants and I like the fact that they allow turning the plants for sun exposure.